Forum News: New and Improved Server Lists! Nearly everyone likes playing Minecraft multiplayer, because it's always more fun with more friends! Still, it can be a daunting task to find just the right server sometimes. Fortunately, we have recently released a helpful forum tool for just this scenario, the Minecraft Forum Server List! The Minecraft Forum Server List is the place for Minecraft players to find the best Minecraft Servers, and the place for Minecraft Server operators to find the best players. 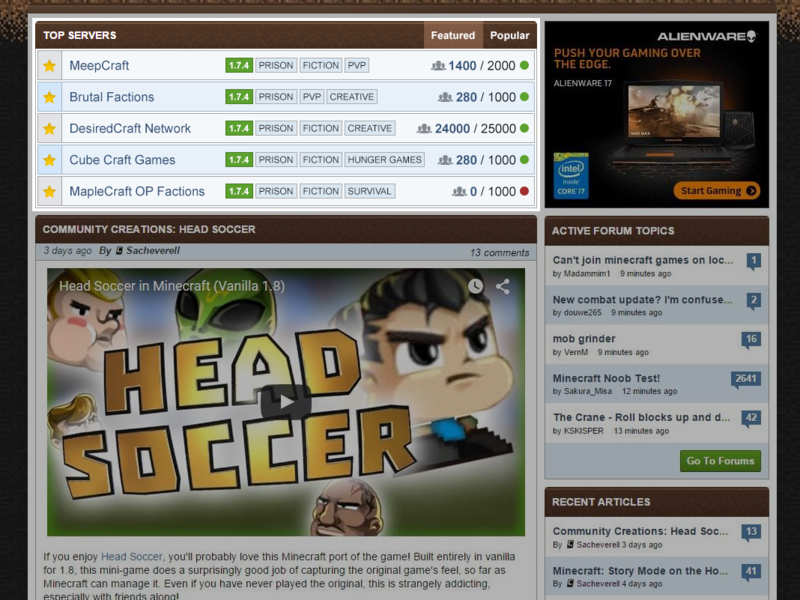 There's a wealth of ways to find your new Minecraft home, search by Popularity, Country, Tags and more. Want mcMMO servers? We've got them! Creative, Pixelmon, Feed The Beast? Those too, and many more. Hover your mouse over "Other" at the top of the server list for a drop down full of filtering options. If you're looking for a quick fix, the front page features the top 5 servers currently listed, which periodically updates. Consider dropping by, and checking them out. This is great for players, but what about server owners? If you run a Minecraft server, adding your server couldn't be easier! Click Add Server from the Server List homepage, and follow the instructions. If you're looking for even more exposure for your server, then check out the Featured Server Auction system for more information on how you can reach even more of our millions of Minecraft Players! Want to know more about the Server List? Check out these helpful links! cool. already posted on Hypixel. Why do I feel the most popular servers will only get more popular thanks to this while the smaller or any new ones will get crushed? I agree to a certain extend, wile this kind of thing (not just in this website but in almost all server lists sites) does make the big server get bigger and the small get smaller if your server has 0 players maybe you should reconsider owning a server, you must be doing something wrong. The argument that little servers are usually junk due to low funding/unoriginality has merit. But it overlooks the servers with actual potential and those which are obscure yet good and creative. The obscure ones could pull something inventive and with a lot of resolve from their owners get noticed. But usually they lack the resources to do so. Overall, I feel we've had enough Hypixel, MineSwine, and MinePlex. I want to see some other new servers with unique concepts appear on that board. One solution to this could be....oh I don't know....actually making featured servers featured servers? Like, instead of an auction board a board full of servers gaining new/recent recognition from the community? Even if the big servers got an update worthy of shooting them back up, they can. But don't wave the big name servers in our faces 24/7 just for your profit. The forums is a community site, not an elite class rules all hierarchy system. Come on now. Usually I like the new features on these sites. This is just horrendous. It needs to be scrapped and reworked, if even re-added at all. Servers aren't all MC has to offer, this a clear money grab. Aren't ads and premium membership fees enough, honestly? Please add the popular GriefPrevention plugin to the list of plugins on the edit page. It is important for players to know if there is block protection available. Thank you! Thank you so much. I'll use the forum if I have anything further. You can't vote for your own server? What kind of ridiculous rule is that? Absurd! How do we turn it off? I have no interest in the big/popular servers and just want to see the latest news post. I agree with you, it just looks odd especially since it is seen before the actual news. They should make a setting in Preferences that turns it off in my opinion. Either that or move it to a different spot like on the right side with the active topics,recent articles (which is honestly pointless since the newest articles are on the main page), and recent server ads. They won't make it an optional feature, and it will always be at the top of the page. This is because the big servers want to get as much attention and advertising as possible. It's kind of sad in reality. I'd like to see the vote button get changed. My users are complaining that they can't find the vote button. Can we make it more clear? Maybe with the word "vote" instead of the up arrow. good feedback. We will make a change. And every day from here on out I see the word "Hypixel" on the top of the page, first thing that loads every time I open this forum... as if that server hadn't been advertised enough on this forum. What about the whitelisted servers? They get no love here! Because of griefing, I will never run my server any other way, and since you have no interest in preserving a sane, mature application process through the new feature, I will stick to the "old" method: Reddit page. Too bad there isn't a way for server administrators to certify and have the server verified every so often for compliance over one certain thing I won't mention, but caused a big spill for what seems to me now, was just a mere waste of time. Basically as I see it, the only servers that really stand a chance to be on the "featured servers" list are those big cash machines. Some beginners never stand a chance when they are introduced to some of the consistent top servers in my opinion. I want an option to turn off this feature. For those that aren't interested in servers this is just an annoyance. And the chosen spot to display it in is the worst.